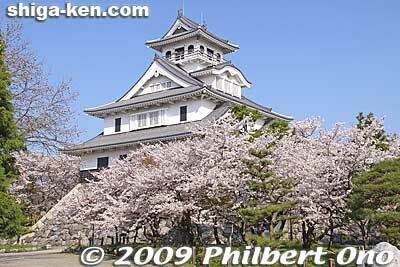 Nagahama Castle in April. More Nagahama photos here. Nagahama (長浜市; Nagahama-shi) is a city in northeastern Shiga Prefecture facing Lake Biwa. Anchoring northern Shiga and a former castle town, Nagahama is one of Shiga's most popular tourist cities with many sights and festivals. Nagahama is Shiga's largest city in area. Almost the entire northern Shiga region (Kohoku) is part of Nagahama. Central Nagahama is easy to reach by train (JR Nagahama Station) and boasts a lakeside castle (reconstructed), traditional buildings, noted temples and shrines, and good food. Pleasant and laid-back place to stroll and shop. 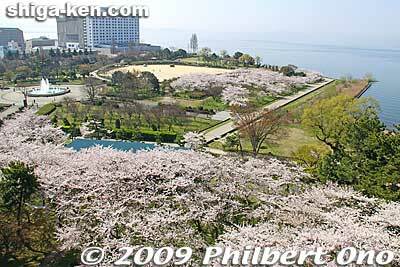 The city covers a wide area including a major portion of Lake Biwa. Nagahama Port has boats going to Chikubushima island in Lake Biwa. Further north is the scenic summit of Mt. Shizugatake and the serene Lake Yogo. Nagahama's most famous festival is the Nagahama Hikiyama Matsuri held in mid-April when young boys perform kabuki plays on ornate floats. The city is dotted with Buddhist temples, Shinto shrines, and over 130 Kannon statues housed in small temples, especially in the Takatsuki area. One beautiful Kannon statue is a National Treasure. Nagahama has an illustrious samurai history with 16th-century daimyo warlords Toyotomi Hideyoshi, Yamauchi Kazutoyo, and Ishida Mitsunari all having once lived in Nagahama. Historical battles also took place in Nagahama. Nagahama boasts a long list of sightseeing attractions. They are categorized in the areas below, following the JR Hokuriku Main Line going north from Nagahama Station. Also, Kinomoto, Yogo, and Nishi-Azai are part of the Oku-Biwako area which is Shiga's northernmost area. Nagahama photos here. Most of the attractions in central Nagahama are within walking distance from JR Nagahama Station. Torahime is most famous for its unusual name. "Tora" means tiger, and "hime" means princess: Tiger Princess Town. Fans of the Hanshin Tigers baseball team in Osaka sometimes come to Torahime and pray for victory. There's even a Tiger Princess shrine at Torahime Station where you can pray for victory. Torahime High School is also one of Shiga's oldest high schools and has one of Shiga's highest rates of college-bound students. A rural area with many rice paddies, Torahime is relatively flat with few mountains. Mt. Ibuki, Shiga's highest mountain in Maibara, can be seen from almost everywhere in Torahime. JR Torahime Station (5 min. from Nagahama Station) on the Hokuriku Main Line is the area's only train station. You can walk to most sights from the station. The Kohoku area is accessible from Kawake Station on the JR Hokuriku Line or by bicycle along the lakeshore road. Nicknamed "Kannon no Sato" or Town of Kannon, Takatsuki has numerous Buddhist temples with noted Kannon statues, including one National Treasure in the 11-face Kannon statue at Doganji (Kogenji) Temple. The area is also the birthplace of Amenomori Hoshu (1668-1755), a major Confucian scholar during the mid-Edo Period. Takatsuki also has a number of ancient tumuli, especially on the mountain range along the lake shore, and a natural hot spring which includes an Egypt Pavilion. JR Takatsuki Station (15 min. from Nagahama Station) on the Hokuriku Main Line is the area's only train station. The west side of Takatsuki Station has a bus stop where you can ride the infrequent Community Bus to go to most places in the town. Taxis are always available on the east side of Takatsuki Station. The Kinomoto area is best known for Mt. Shizugatake which provides grand views of Lake Biwa and Lake Yogo. It was also the site of the Battle of Shizugatake where Toyotomi Hideyoshi defeated Shibata Katsuie. Kinomoto-juku was also a lodging town on the Hokkoku Kaido Road linking the Hokuriku region with Kyoto and Edo. Kinomoto also has its share of noted Kannon temples. A new and spacious Kinomoto Station building was completed in 2007. The Kinomoto area is accessible from JR Kinomoto Station on the Hokuriku Main Line (15 min. from Nagahama Station). There is a tourist information counter in the train station where you can obtain maps and rent bicycles. Yogo is Shiga's northern-most area approaching Tsuruga Bay in neighboring Fukui Prefecture. Most residents and visitors confine themselves to southern Yogo where Lake Yogo is. Mountainous and often beset with snow, the area has a major asset in Lake Yogo, a small but scenic lake right above Lake Biwa. Yogo has only one train station, JR Yogo Station on the Hokuriku Main Line. A very quiet and scenic area to get away from it all. There are a few lodges where you can stay. Mt. Shizugatake 賤ヶ岳 - See description above under Kinomoto. Occupying the northern-most shore of Lake Biwa, Nishi-Azai was formerly a bustling port town on the lake for over 1,000 cargo boats (called maruko-bune) plying between the north and south of the lake during the Edo Period. It was part of a trade route between the Hokuriku region and Kyoto/Osaka. Logging and fishing used to be the area's main industries, but it now mainly manufacturing. With the advent of train lines replacing the boats, Nishi-Azai is now a quiet and scenic area along the lake. A foot path along the shore is pleasant and scenic. Nishi-Azai has two train stations: Omi-Shiotsu Station on the JR Hokuriku Main Line and Nagahara Station on the JR Kosei Line. Omi-Shiotsu Station (22 min. from Nagahama Station) is a transfer station for the Hokuriku Main Line and Kosei Line. You can rent a bicycle at Nagahara Station and ride along the lake shore toward Sugaura. Or ride in the opposite direction toward Makino Station in Takashima during which you will pass by Kaizu-Osaki noted for cherry blossoms. You can drop off the rented bicycle at Makino Station instead of riding back to Nagahara Station. The lakeshore road is flat and scenic for cycling in either direction (toward Sugaura or Makino). Buses leave Nagahara Station and Omi-Shiotsu Station for places of interest with an infrequent schedule. Jan.-March - Okonai オコナイ procession is held in northern Shiga in various neighborhoods for a rich harvest during the coming year. A few men carry thick straw ropes and parade around. "Okonai" means "to do your utmost." Early May (Golden Week): Koinobori Marathon (Takatsuki) 高時川こいのぼりマラソン is held along the river while carp streamers fly. There is the Family Course (3 km) and Enjoy Course (8 km). Call 0749-85-3078. 3rd Sun. in May: Oku Biwako Kenko Marathon (Nishi-Azai) 奥びわ湖健康マラソン Three marathon courses of 1.5 km, 5 km, and 15 km. Registration required. Aug. 16: Chanchako Matsuri (Nishi-Azai) ちゃんちゃこ祭 held at Shimo-Shiotsu Shrine. Centers on a taiko drum dance lasting until the evening. Aug.-Sept.: Tomyo Lantern Festival (Torahime) 灯明祭 - Lanterns decorate the shrines and temples as a prayer of thanks for a rich harvest and family safety. Sept. 13: Moroko Festival (Takatsuki) もろこまつり is held at 乃伎多神社. Children in costume pray for the town's safety and a rich harvest. There is a tourist info office in Nagahama Station, 2nd floor near the turnstile (turn right). Most places of interest such as Nagahama Castle and Kurokabe Square are within walking distnce from Nagahama Station. Other places like the Kunitomo Gun Museum and Ishida Mitsunari Birthplace can be reached by bus from Nagahama Station. Nagahama Port (boat cruises to Chikubushima) is also within walking distance from Nagahama Station. Rental bicycles available near Nagahama Station. Ask tourist office in Nagahama Station for directions. (Bicycle drop-off OK at Sakata Station or Kawake Station). Rental bicycles also at Kawake Station, Kinomoto Station, Yogo Station, and Nagahara Station. The Nagahama International Friendship Association is in a nice wooden building with clean and low-cost accommodations. The Hokuriku Main Line and Biwako Line runs through Nagahama, and Nagahama Station is the main station and gateway. Nagahama has more train stations further north along the Hokuriku Line. From Tokyo Station to Nagahama Station - 2.5 hours via JR Tokaido Shinkansen Hikari to Maibara Station, then 9 min. via Hokuriku Main Line (Biwako Line) to Nagahama Station. From Kyoto Station to Nagahama Station - 72 min. via JR Biwako Line. Or 22 min. via Tokaido Shinkansen Kodama to Maibara Station, then 9 min. via Biwako Line to Nagahama Station. From JR Nagoya Station to Nagahama Station: About 25 min. via Tokaido Shinkansen or 1 hr 15 min. via Tokaido Main Line (train transfer at Ogaki Station may be required) to Maibara Station, then 9 min. via C to Nagahama Station. From Maibara Station to Nagahama Station - 9 min. via JR Tokaido/Biwako Line. From Hikone Station to Nagahama Station - 15 min. via JR Tokaido/Biwako Line. From Otsu Station to Nagahama Station - Approx. 57 min. via JR Tokaido/Biwako Line. From Omi-Imazu Station to Nagahama Station: 50 min. via Kosei Line and transfer at Omi-Shiotsu Station for Hokuriku Main Line. From Tsuruga Station (Fukui Pref.) to Nagahama Station: 42 min. via Tokaido Main Line. Local buses leave from Maibara Station (West exit), Omi-Nagaoka Station, Samegai Station, and Kashiwabara Station. Most sights in central Nagahama are within walking distance from Nagahama Station. Other places can be reached by bus. Rental bicycles also available. Inquire at the tourist info office in Nagahama Station. Train stations further north along the JR Hokuriku Line make Torahime, Takatsuki, Kinomoto, Yogo, and Nishi-Azai (Omi-Shiotsu and Nagahara Stations) easily accessible. More photos at Nagahama Photos. More Shiga photos here. Click on the video image to start playing the video. More Shiga videos here. Other sights in neighboring cities/towns within easy reach from Nagahama. 1882 The Hokuriku Railroad opens, diminishing the importance of lake transport maruko-bune boats from Nishi-Azai. Torahime village founded on April 1. Nagahara Village and Shiotsu Village are established. 1918 Kinomoto village becomes a town. 1940 Torahime town founded on Dec. 10. 1943 City of Nagahama established upon the merging of Nagahama town and neighboring villages. 1952 The present Nagahama City Hall is built. Azai-cho town established upon the merging of four villages. Takatsuki town founded in Dec. upon the merging of three villages. Kinomoto town merges with three neighboring villages. Yogo village merges with two other villages. 1955 Nagahara Village and Shiotsu Village merge to form Nishi-Azai Village. 1956 Biwa village established upon the merging of two villages. 1965 Maruko-bune boats completely disappear from Lake Biwa. The history of cargo transport on the lake ends after over 1,000 years. Biwa village becomes a town. Nishi-Azai Village becomes a town. Yogo-mura village becomes Yogo-cho town. 1984 Amenomori Hoshu-an museum opens in Takatsuki. February 13: Neighboring towns Azai-cho and Biwa-cho merge with Nagahama. October 14: The new Nagahama Station opens. The new Kinomoto Station is completed. 2007 Prime Minister Shinzo Abe visits Kurokabe Square and Chikubushima with Governor Yukiko Kada as the guide. 2010 Shiga's six northern towns of Torahime, Kohoku, Takatsuki, Kinomoto, Yogo, and Nishi-Azai merge with Nagahama on Jan. 1, 2010. 2016 Nagahama Hikiyama Festival inscribed as a UNESCO Intangible Cultural Heritage of Humanity as one of 33 "Yama, Hoko, and Yatai float festivals in Japan." In front of Nagahama Station is a statue of Toyotomi Hideyoshi meeting a young Ishida Mitsunari at Kannon-ji temple. Hideyoshi was doing falconry and took a break at the temple where Mitsunari served Hideyoshi three cups of tea. The first cup was a large bowl of lukewarm tea to quench Hideyoshi's thirst. The second cup of tea was a medium-size cup and medium hot. The third cup was a small cup of hot tea so Hideyoshi could taste the tea. This so impressed Hideyoshi that he hired Mitsunari on the spot. Built in 1952, the current Nagahama City Hall is too small and too weak to withstand a strong earthquake. So proposals are being made to build a new city hall on the site of the old Nagahama Hospital which is almost across the street. The population of Nagahama is estimated to increase to 170,000 by 2015, assuming that the northern towns of Torahime-cho, Kohoku-cho, Takatsuki-cho, Kinomoto-cho, Yogo-cho, and Nishi-Azai-cho will merge with Nagahama, along with the neighboring city of Maibara. Since the mergers are not yet certain and the money for constructing the new city hall has not been secured, it's still a long way before a new city hall can be built. Famous warlord and founder of Nagahama and who renamed Imahama as Nagahama. Vassal of Toyotomi Hideyoshi and later leader of the unsuccessful Western Forces at the Battle of Sekigahara against Tokugawa Ieyasu in 1600. Nagahama was his hometown. Warlord who ruled northern Omi in the 16th century from Odani Castle. Married to Oda Nobunaga's sister Oichi, but fought against Nobunaga. Defeated at the Battle of Anegawa River by Nobunaga and Tokugawa Ieyasu in 1570. His Odani Castle was beseiged by Nobunaga in 1573, and he committed seppuku ritual suicide in the castle. His wife Oichi and three daughters were allowed to return to Nobunaga. Warrior famous for Japanese tea ceremony, landscape gardening, and architecture. Native of Biwa-cho and diplomat who was present at the Russo-Japan Peace Conference at Portsmouth, New Hampshire in 1905 where Russia and Japan signed a peace treaty. Among the Japanese delegation, which incuded Japanese Ambassador to the US Kogoro Takahira and Japanese Foreign Minister Jutaro Komura, Ochiai was the only one who could speak Russian. Also served as ambassador extraordinary in Italy and Holland. Major Confucian scholar and leading diplomat to Korea during the Edo Period. Born in Amenomori village in Takatsuki, Hoshu first studied medicine in Kyoto. Later he moved to Edo (Tokyo) where he studied Confucianism under Confucian scholar Kinoshita Jun'an 木下 順庵. He was hired by the Tsushima clan in Nagasaki and was put in charge of Korean relations at age 22. Tsushima was an island domain close to Korea which had trade relations with Korea. Tsushima was put in charge by the Tokugawa shogunate to handle Korean relations. At age 25, Hoshu learned Chinese. At age 36, he lived and studied Korean in Pusan for 3 years during 1702-1705. He even wrote a book to teach basic Korean conversation. Hoshu rightly believed that language represented the culture, and learning the language was thus essential to understand the country. He also traveled with the Korea's royal embassy dispatched from Korea to Edo in 1711 and 1719. Hoshu today is regarded as a pioneer in Korean-Japanese relations and an internationally-minded person ahead of his time. The East Asia Exchange House Amenomori Hoshu-an Museum 東アジア交流ハウス雨森芳洲庵 in Amenomori, Takatsuki, Shiga is dedicated to him and Japanese-Korean relations. He is buried in Tsushima, Nagasaki. Buddhist priest from Jumanji temple (Nishino Yakushido) who engineered and built the Nishino Suido water tunnel through the mountain to Lake Biwa to relieve flooding. It took 6 years to build the tunnel. - Native of Takatsuki in northern Shiga and founder of Yanmar Diesel Co. At age 24, established Yamaoka Hatsudoki Seisakusho 山岡発動機工作所, the forerunner of Yanmar Diesel Co., now called Yanmar Co. In 1933, he developed the world's first compact diesel engine. Buddhist priest of the Tendai Sect born in Mikawa, Torahime. Gyokusenji temple is built near his birthplace in Torahime. Entered the priesthood at age 17 on Mt. Hiei's Enryakuji temple. 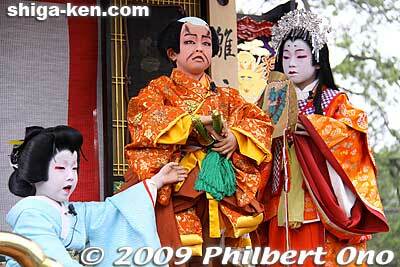 In 966, he became the 18th head priest of the Tendai Sect at Enryakuji. He renovated the dilapidated temple buildings, and promoted education and scholarship on Mt. Hiei. Since he died on Jan. 3, he has been called "Gansan" (3rd of the New Year). He also is noted for omikuji fortunes. This page was last edited on 18 April 2019, at 12:43.